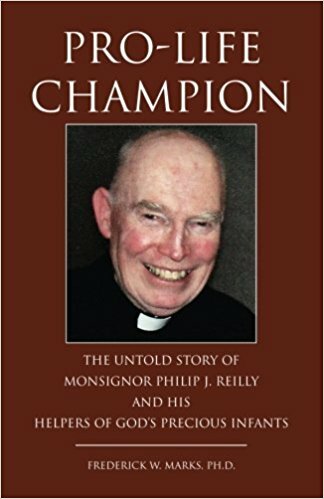 "Pro-Life Champion: The Untold Story of Monsignor Philip J. Reilly and His Helpers of God's Precious Infants"
PRO-LIFE CHAMPION is the untold story of Monsignor Philip J. Reilly, who, almost single-handedly, reclaimed the pro-life movement from a course of violence by setting it on a path to prayerful, non-confrontational witness to the sacredness of human life. In the course of rescuing the movement from an untimely death at the hands of pro-choice politicians, he has counseled thousands of distraught women on the street and trained hundreds of like-minded individuals to do the same, thereby saving an estimated hundred thousand lives. As for the salvivic effect of his intervention on the souls of countless parents bent on destroying God's greatest gift, it is beyond telling. The Helpers of God's Precious Infants, which he founded in 1991, has chapters in forty-five American states, as well as thirty foreign countries. This is the story of a Latin teacher and prep school principal who sacrificed an academic career in order to answer God's call, a man who risked his life in order to awaken people to the devastating effect of destroying innocent human beings. With Scripture as his sword -- "Before I formed you in the womb, I knew you" (God to Jeremiah) and Isaiah's rhetorical question, "Can a mother be without tenderness for the child of her womb?" -- he organized police-protected prayer vigils led by Catholic cardinals with up to 2500 participants at a time. He has been on the receiving end of rotten eggs, vitriolic invective, and a $117 million law suit. Six times arrested (before opting for non-violence), he has likewise been dragged into court scores of times without ever losing his sense of humor. One of the organizers of the first March for Life in Washington, D.C., he counts among his students Joe Scheidler, founder of the Pro-Life Action League, and David Bereit, founder of 40 Days for Life. Frederick Marks, who holds a Ph.D. degree in history from the University of Michigan, has written an account of the life of Msgr. Reilly that is both gripping and scholarly, based, as it is, on seventy hours of interview time with its subject. This is more than a biography. 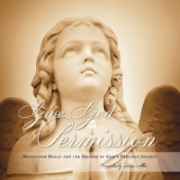 It sets the work of a distinguished prayer warrior against the broader backdrop of the pro-life movement in general, taking the reader all the way from Colorado's decision to become the first state to legalize abortion down to the present. "Pro-Life Champion: The Untold Story of Monsignor Philip J. Reilly and His Helpers of God's Precious Infants" By Frederick Marks, Ph.D.
"GIVE GOD PERMISSION: MONSIGNOR REILLY AND THE HELPERS OF GOD'S PRECIOUS INFANTS"
"Give God Permission: Monsignor Reilly and the Helpers of God's Precious Infants" tells the story of Monsignor Reilly of Brooklyn, New York and the organization he founded, the Helpers of God's Precious Infants. The book has an extensive photo gallery of Monsignor Reilly's worldwide travels to spread the message of "Life", numerous prayers and devotions, the pro-life Stations of the Cross, and meditations on the sanctity of life taken from Monsignor Reilly's recorded talks and sermons. Life Site News: "Msgr. Philip Reilly’s Vision of 9/11’s Connection to Abortion"
Mere Catholicism: "Helpers of God’s Precious Infants at A Woman’s Preferred Health Center"
Archdiocese of Galveston-Houston, Texas: "Who Are the Helpers?" Abortion Hurts Albury: "Press Release from the Helpers of God's Precious Infants"
The Border Mail: "God's Helpers 'Encouraged'"